Tens of thousands of women have held a general strike as well as protests across the Israeli-occupied territories to voice their anger at the Tel Aviv regime’s failure to stem a sharp increase in violence against women. On Tuesday, protesters staged separate rallies in several cities, calling on Israeli authorities to take action to stop the killings of females during domestic violence-related incidents. 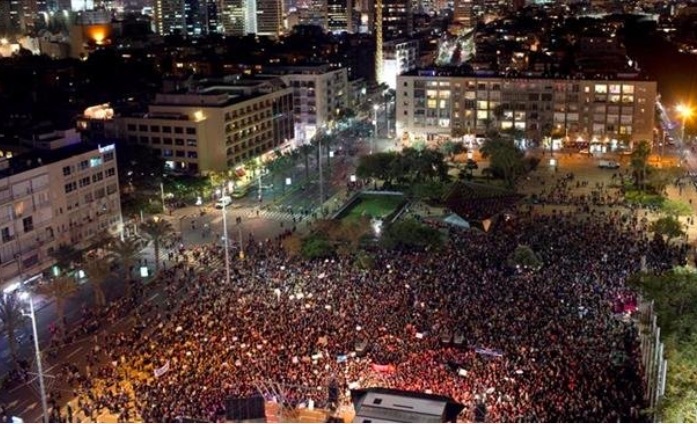 Dressed mainly in black with red hats, and carrying red balloons and torches, some 30,000 demonstrators gathered in central Tel Aviv to urge the Israeli administration to address the issue. Some 200 pairs of women’s shoes, painted red, were also placed on display on Habima Square in central Tel Aviv in a sign of protest. Organizers of the protests demanded that a budget of nearly a $70 million be allocated to combating violence against women. The strike was called last week in the wake of the recent murders of two teen girls, whose deaths brought the number of women, who were killed over the past year in domestic violence-related incidents to 24, the highest in years. Over 300 institutions, municipalities, schools, and groups joined the strike and the protesters observed a moment of silence to mark the deaths. A day earlier, activists poured red dye in public fountains in several cities to draw attention to the protest. Shortly after the end of the rally, Netanyahu’s office announced that the prime minister would convene a meeting of the ministerial committee on violence against women on Wednesday morning. On Monday, the opposition’s Zionist Union brought a no-confidence motion, denouncing the regime’s failure to curb such violence.